Like the button? Visit http://www.annetaintor.com/ for other great images!! Lately I have had a borderline obsession with grilled cheese sandwiches. Now that Jack is eating more solids and real people food, we have been giving him bits of grilled cheese sandwiches for lunch. I was never really a big fan of grilled cheese, but one day I found myself finishing the half he didn't eat . I enjoyed it, but chalked it up to extreme hunger. Until I was craving another one hours later. And thus the obsession began. Grilled Cheese sandwiches are a great go-to dinner because they are something the whole family can eat. I make Jack's the real quick and easy -or some would say lazy-way. I toast 2 slices of bread, add 2 slices of American cheese to them and pop it in the microwave for 10 seconds. For older kids, you can do the same thing but cut them into sticks. Give them some tomato soup or even a little spaghetti sauce and let them dip the "cheese sticks" in them. -Sourdough bread, Colby and Provolone, Turkey Bacon and Avocado. -try swapping out butter for Miracle Whip...it gives the sandwich a little zip. Just be careful to not use too much because it can make for a soggy sandwich. -Add a little olive oil to the pan. It add's a nice little crunch to your sandwich. -cook slow and low...reduces the chance of burning the bread,. Don't be afraid to experiment and add things that you like. No one says that a grilled cheese has to be boring! -Tomato soup-the good old standby...but any soup will do. -Chili-we always make a big batch and freeze it. It's easy to thaw for a quick dinner! Welcome all visitors from any of Monday's blog hops! I hope you can link up and share with us. That looks so gd! 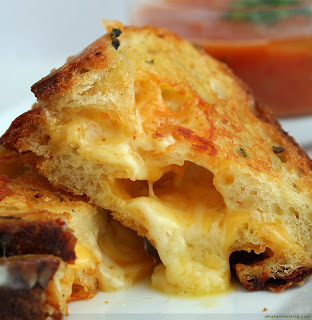 It's getting that time of year grilled cheese and tomato soup Visiting form meet up mon! I'm going to try Miracle Whip on my next grilled cheese. That sounds interesting. Oh that looks so yummy. Tonight its just a quick mac and cheese, chicken and salad. Thanks for coming by and following. Im following you back. Have a great Monday! Hi, I am your new follower. 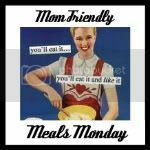 For the next time I will make any food on Monday so I can linking at you blog hop. Thank you for the share, take care! Hello, blog hopping along. Thanks for the meal idea for tonight.